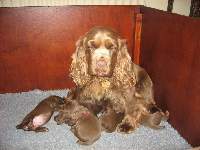 Search and adopt a Sussex Spaniel near you. Although the Sussex Spaniel originated centuries ago it derives its origin from the county of Sussex, England, and it was used there since the eighteenth century as a field dog. The breed’s appearance has remained virtually unchanged still today. The Sussex possesses a rich golden liver coat unique to the breed, and has a long, low and somewhat massive body. Although not as fast as other Spaniel breeds, the Sussex has a great nose and is well suited for working through dense underbrush on the hunt. While the Sussex Spaniel was one of the original nine breeds recognized by the AKC in 1884, it has actually existed as a breed for much longer. Despite its somber and serious expression, the Sussex is friendly, with a cheerful and tractable disposition. They enjoy walks with their families and are good with children and other dogs. The Sussex requires weekly brushing, with special attention paid to anything that might have gotten caught in their long, thick ear hair. Owners should also be prepared for a large quantity of drool. AKC recognized in 1884. Size from 13 to 15 inches tall, 35 to 45 pounds. Despite its somber and serious expression, the breed is friendly and has a cheerful and tractable disposition, slow paced, but can have a clownish and energetic temperament. The Sussex Spaniel is a calm breed with somewhat clownish behaviour that normally keeps his energy and enthusiasm in check. He is always eager to be around people, is excellent around children, and can be quite protective of the family. They suffer from health conditions common to spaniels and some large dogs, as well as a specific range of heart conditions and spinal disc herniation. First bred in 1795 for specific hunting conditions, they nearly became extinct during WWII. They make excellent candidates for therapy dog work. Most Sussex Spaniels are primarily family pets, but they are competent enough to aid a hunter though quite stubborn to train.